Who does not like some Extra Cash in hand? Not that everyone is greedy, but having some extra money to spend is not a bad thing at all! And this is what this slot game aims at! You will be flooded with opportunities to win lots of cash in this interesting slot. This 5 reel and 50 payline slot game comprises impressive 3D graphics along with quality background audio. Featuring some helpful bonus rounds including re-spins, extra wilds and free spins, Extra Cash can be the best video slot to gain some additional cash during free-time. There was a time, when people used to get details on market and all other things from newspapers. Today we have TVs, radio stations and many other sources of news that’s why the golden era of newspapers has gone. However, NextGen Gaming’s Extra Cash takes you back in that era and gifts you several perks. The slot machine is set in front of some buildings and the paperboy is standing to the left side of slot machine by holding Extra Wild bag. This game features 3D graphics that improves impression of this video slot. The main symbols, which create winning combination with the wild, are chosen wisely according to the theme. The main symbols are a little red cart, a bundle of newspaper, a dog, newspaper van and a kiosk. Game also features low value slot game symbols, but you should plan to land on the wild or scatter with high value symbols to maximize your winnings. The newspaper headline is the wild symbol and scatter symbolizes the printing process. You can start betting from £0.50 per spin and go on till £100 per spin. Extra Cash has some innovative bonus rounds that help you in converting small bets into some big wins. Many players may think that the paperboy is standing next to the slot machine just to improve visual attraction of the game, but actually he adds extra wilds to the reels. This extra wild feature is randomly triggered in both base and free spins. The re-spin feature is triggered when players land on 2, 3, and 4 scatters during the main game. Reels that do not contain any scatter symbol, spin in the re-spin round to reward you with a better sequence of symbols. 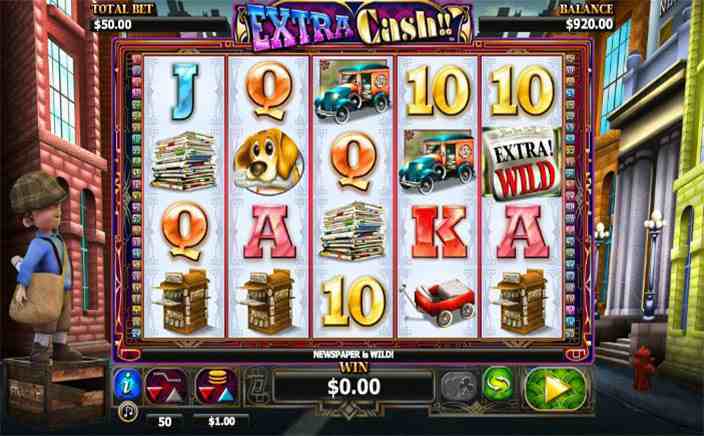 Extra Cash video slot can reward you up to 20 free spins depending on the number of scatters you land on. You must get at least three scatters to trigger the free spin feature, two scatters can reward you only re-spins, but not free spins. 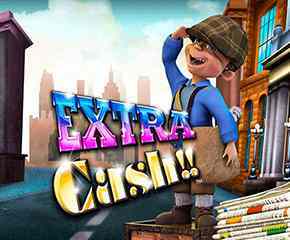 With 96.23% RTP and ability to perform on all devices, Extra Cash is an amazing video slot for all slot lovers.